The Japanese holiday season is inverted compared to the US. Christmas is spent as a partying frenzy and as we approach the New Year things slow down. The days before New Year, we spend cleaning our houses and preparing osechi. Osechi is food that keeps well and tastes OK cold. Cooking a lot of osechi allowed the women (who typically did the cooking in the house) to take a break for a few days during the new year. The idea is to cook up a bunch of osechi, eat your noodles, go to the shrine, ask for good luck, and take a break. 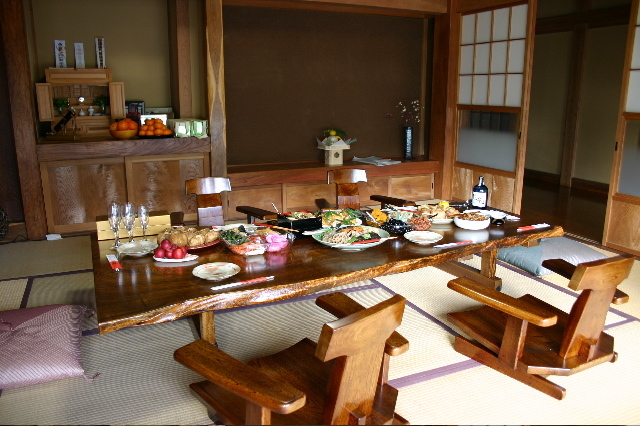 During the first few days of the new year, you visit family, eat osechi and basically chill out. I think this is more efficient than the US form where you wake up drunk and hung over on in the New Year with a fuzzy recollection of a bunch of unrealistic New Years resolutions. Yesterday, I helped Mizuka clean the house, she did most of the cooking (osechi is a bit of an art) and we had her family over for New Years osechi brunch. I passed out (sober) on the floor cuddling with Bo and slept for 18 hours. Joi, I think you are generalizing too much in your comparisons between Christmas in the US and the New Year in Japan. "Christmas is spent as a partying frenzy." Not in my family, although I will admit that the shopping can be hectic at times. Christmas for me and I'd guess for a lot of others is very similar to a Japanese New Year. Its a time to spend with family eating and chilling out. Celebrating the New Year is much the same for my family. We stay at home, eat certain foods, watch tv, and might have one drink to welcome the new year. I also noted that you did not include the countless bonenkai that lead up to the New Year in Japan. Did you just forget, or did you intentionally not include it because it didn't support your opinon that "this is more efficient than the US form where you wake up drunk and hung over?" There is some truth in your post, especially for some people in the US, but I think that you are giving a slightly false impression of the holiday season in Japan to people who have never lived here. 18 hours is a very long time to sleep, as you mentioned in a subsequent post. How interesting - it must be difficult to sleep that long without waking. It occasionally happens. There is this "I'm on vacation" switch in my brain that seems to make it shutdown and reboot when I know I don't have any pressing issues for several days. It happens every few years for me. Joi Ito - "Japanese New Year" by Joi Ito is licensed under a Creative Commons Attribution 4.0 International License.